All Trump all the time media coverage lets Trump define the discussion. It denies voters a broader, better discourse. Network news coverage of Trump has been so overwhelming for so long that there are folks who argue that media outlets should simply press pause and dial down their coverage of Trump. That never works, and it shouldn’t. When a candidate is playing to the worst fears of Americans, what’s needed is more serious and intensive coverage that puts things in perspective. In an atomized media environment, with old and new and social media providing constant flows of information, Trump will always figure out how to get the attention that he craves—and that powers his campaign. For instance, even as Republican leaders offer up mild complaints about Trump’s religious-test bigotries, they will welcome him to another debate stage December 15. The key is not to neglect Trump, but rather to provide more and better coverage of the whole of the 2016 campaign. Serious media coverage is necessary to keep Donald Trump—and the 2016 race—in perspective. The point here is not to raise up alternative candidacies and ideas that are on the margins. The point is to recognize that there are other candidates who are getting as much support as Trump, that are exciting crowds and gaining significant support, and that are advancing dramatically different responses to the challenges facing America. That’s not happening now. Even when Democratic front-runner Hillary Clinton is covered (and it is important to note that she is now getting a lot less coverage than Trump), the coverage is increasingly focused on her responses to the billionaire’s obnoxious and irresponsible statements. When the Democratic front-runner calls out the Republican front-runner’s crude scheming to bar Muslims from the United States, that’s a story, to be sure. But it should also be a story when Clinton proposes a National Infrastructure Bank and a sweeping overhaul of the nation’s transportation system—as she did in St. Louis Friday. 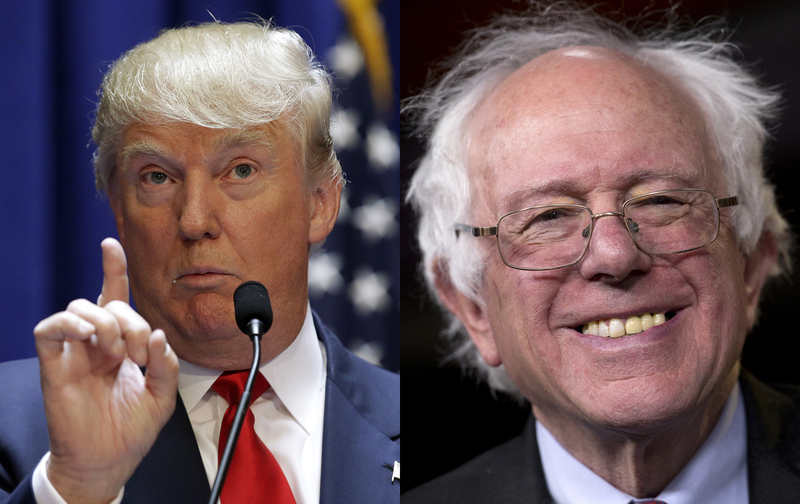 Trump and Sanders are dramatically different contenders offering polar opposite proposals for the United States. Yet each has attracted a passionate following. And that has translated into similar levels of support. On the Republican side, the Real Clear Politics poll averages have Trump attracting 30.4 percent support nationally among voters who might reasonably be expected to participate in Republican primaries and caucuses. On the Democratic side, the RCP poll averages have Clinton leading. But Sanders is attracting 31 percent support in the Democratic race—a better number than Trump. According to RCP, Trump has a polling average of 25 percent in the first-caucus state of Iowa. RCP has Sanders at 37 percent in Iowa—10 points better than Trump. Bernie Sanders attracts more support than Donald Trump, but gets dramatically less coverage. According to RCP, Trump is leading the Republican field in the first-primary state of New Hampshire with 28.7 percent. But Sanders is leading in New Hampshire, with RCP’s average putting him at 47.3 percent—almost 20 percent better than Trump. Polls should not be the only determinants for coverage of campaigns—or for inclusion in debates. Candidates like Republican Lindsey Graham and Democrat Martin O’Malley, who are not polling big numbers, can still bring big ideas and necessary perspectives to the discourse. But polls do provide a measure of perspective. And not just polls of the Republican and Democratic nomination contests. How about polls of potential November match-ups with Trump? Most of the match-up polls pit Clinton against Trump, and she is ahead; RCP’s average has her at 47 percent to 43.7 for the billionaire. GET THE LATEST NEWS AND ANALYSIS DELIVERED TO YOUR INBOX EACH MORNING. Surveys from a number of battleground states show Sanders swamping Trump. In Wisconsin, for instance, the latest Marquette Law School poll has Sanders beating Trump 52-35, while Clinton beats Trump 48-38. Right now, that’s not what Americans are getting from the network news. * Trump has received more network coverage than all the Democratic candidates combined. * Trump has accounted for 27 percent of all campaign coverage this year. Trump should be covered. But so, too, should other candidates on the Republican and Democratic sides. There’s no need to dial down coverage of anyone, not Trump, not Bush. But there is a need to dial up coverage of candidates who are not Trump and who are not preaching lite variations on Trumpism—candidates like Clinton and Sanders who are speaking to America’s hopes rather than its fears, and who are attracting significantly higher levels of support than Trump.